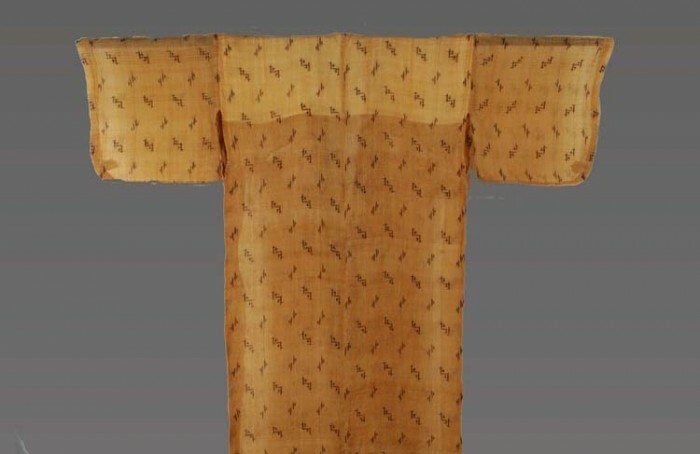 A genuine fine bashofu kimono dating back to late 19th century from Ogimi Village is for sale at an antiques dealer. Kijoka in Ogimi Village is synonymous with bashofu, a Japanese fiber banana, which is a family of common banana trees but unlike bananas not grown for eating. ‘Fu’ means textile or fabric. ‘Bashofu’ is textile woven from the Basho tree fiber. In the Ryukyu Kingdom era, bashofu was also worn not only by common folks as a summer garment, but by the royal family and family members of the samurai class. Making bashofu is known to take plenty of time and effort. It is said that the weaving process represents just 1% of the whole process. The process starts with planting and growing basho for several years, meanwhile cutting leaves and tops of the core off three or four times a year only between March and September in order to soften fibers. Peeling, boiling and splitting follows cropping in autumn though winter season to make slender thread. The process of just making thread has eight steps. After that, there are more work processes of dyeing, weaving and finishing. Furthermore, all of the steps have to be done by hand. As it is now, bashofu weaving is seen in no other place than Kijoka in Ogimi Village. Bashofu is popular among Kimono fans as summer wear because its thinness, lightness and strength. Toshiko Taira, who made great efforts in conservation and inheritance of bashofu, was herself certified as an Important Intangible Cultural Heritage. Producers only can make about a total of 250 rolls of bashofu per year due to thousands of manual working hours necessary. A roll of kimono cloth has about 12 yards of the fabric, and accordingly, the value of a kimono woven from bashofu is increasing year by year. Bashofu kimonos nowadays fetch a high price like a million to several million yen.